Rich colors, a fabulous finish and of course pure linen...It's simple, yet chic, and can be used for every occasion. Available in table cloths, runners and napkins. No longer looking for the perfect elegant table setting : a true "dream" for every party hostess/host . Now also introducing the EVERY DAY napkin with simple hemstitch. The tablecloth has a 15 cm (6") mitered corner finish. The table runner and napkins have a 5 cm (2") mitered corner finish. 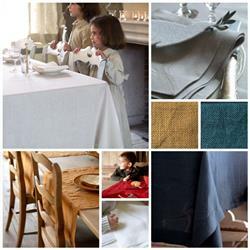 100 % Linen PRE-WASHED- available in a wide range of subtle colors to complement any dining room.